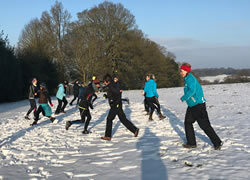 Stones Health & Fitness | Step Outside…..
With the recent snow fall and some super outdoor fitness sessions in the snow, I was keen to remind everyone of the virtues of getting fit in the great outdoors. During the winter months, day light hours are limited and the weather does not always allow for you to venture outdoors. However, just getting out for even an hour, moving at pace, with an activity that makes you breath harder, raises a smile and makes you feel good when you are done, has many health and wellness benefits. Vitamin D, mostly between March and October, from sunlight exposure, is needed by the body to absorb calcium and phosphate from our diets, which are essential for healthy bones, teeth and muscles. It can also increase our capacity to uptake and utilise oxygen, helping with physical health. We also can’t ignore the mental health benefits of exercising outdoors. Mental health has a big knock on effect our physical health and capabilities. Although many studies have been conducted there remains a difficulty defining and quantifying the benefits of outdoor fitness improving mental health. Personally, I love to exercise outdoors and I have run outdoor fitness sessions for the last twenty five years. During these sessions there is a marked raise in mood as the one hour progresses, with the group interacting in a very relaxed way as they carry out exercises they are unlikely to do at the gym. The kaleidoscope of changing colours, smells and terrain make the exercises seem easy and the time passes quickly, bringing happiness and raised mood, as self-reported by the client. There’s no doubt that mental health has been improved subjectively, but with the variation in client profiles and environments it’s difficult to quantify. Your activity could be a formal group outdoor fitness that encompasses well planned sessions or it could simply be stepping inside your own headspace into the great outdoors, undertaking the activity of your choice ; running, cycling , open water swimming or maybe keeping it simple if you are just embarking on your first outdoor fitness adventure, which will make it more achievable and easier to succeed. Experiment and you will see that the faster you move the arms the faster the legs will need to move. Use your arms as your accelerator to pick up at a pace that means you are slight breathless with 6/10 effort. With your Heel to mid-foot planted, push off through the forefoot, driving forward from the glutes as you power the legs. Try and get out for at least 30 mins a day, increase the distance you cover on your allotted time. Incorporating some strength exercises along the way as an additional option. See below a useful link if you would like to read more….